Mr. Kenneth Seat teaches Modren World History at Blair. Mr. Kenneth Seat is a Blair teacher who taught in Japan. His experience in Japan helped him understand more about what areas students who are learning English need to develop here at Blair. He acknowledges that he uses different strategies to help international students get some help that they need. Mr. Kenneth Seat teaches modern world. history now, but he taught English in Japan for two years. 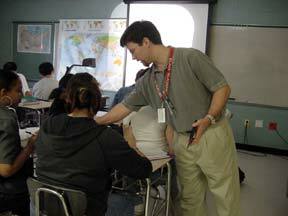 He uses those experiences to help him to teach the ESOL students in his class. "My experience in Japan teaching students English as their second language is important," he said. Mr. Seat understands what students need to get help with. Each individual student might have different weakness area, but Mr. Seat feels that students are more likely to struggle with vocabulary. "I know sometimes which words are difficult," he said. To help them with that kind of problem, he tries to speak slowly and writes things on the board. But at Blair there are challenges for teachers. "It's hard to meet everybody's needs because everyone has a different ability level," Mr. Seat said. Of course, everybody learns in different ways. Some students like to go fast and some need to slow down a little. "If I go too fast they get lost and if I go slowly they say it's too boring," he said. But he knows what to do to solve that problem. "I teach using different strategies to cover the basic information for the whole class and give extra work to kids who can handle more difficult ideas," he said. Once he gets the class settled he can go around the room and talk to other kids. Students in other countries are taught differently than in the United States. The ways students in Japan learn is different than students in the United States because of the way that teaching system and process is set up. For example, students in Japan learn by sitting in rows, listening, and taking notes. The class doesn't have much interaction between the teacher, students and the classmates. They don't do things like brainstorm and discuss ideas together. But Mr. Seat said, "It is very important for students to explore ideas." In the United States teachers like to do different things to get students to use critical thinking. For example, teachers in the United States want their students to understand the meaning and able to analyze in their own thoughts by not just taking the information's given by the teachers. These ideas are not common for the teachers in other countries. Mr. Seat said some students who come to Blair from other countries are like his students in Japan. "Students expect to listen and take notes." They all expect to learn the facts, when, who and how it happened. But they are not required to think more profoundly about why they have to learn that facts and how the facts affect other things. In Japan students don't interact together. They don't work in groups like in the United States students do, so they don't experience working in groups to share different opinions and have their own perspectives viewed at different angles. Mr. Seat knows that things like working in groups can be hard for some students from other countries. When teachers know these things, it makes it easier for them to help students from other countries.